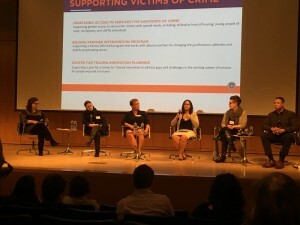 Barrier Free Living’s Chief Program Officer Cynthia Amodeo participated on a panel as part of the Criminal Justice Investment Initiative (CJII) Grantee Conference on March 22. Cynthia spoke on a panel of grantees about the Deaf Services Initiative, funded by the Manhattan District Attorneys Office (DANY). The conference was sponsored by DANY and the CUNY Institute for State and Local Governance, which is an administrator and technical assistance partner of the CJII grant program. The panel included (as pictured, from left to right): Susan Herman, Senior Advisor to the Mayor, Office of ThriveNYC (moderator of the panel); Charlene Obernauer, New York Committee for Occupational Safety & Health; Carla Smith, Urban Resource Institute; Cynthia Amodeo, Barrier Free Living; Anne Patterson, STEPS to End Family Violence; and Richard Smith, Common Justice.